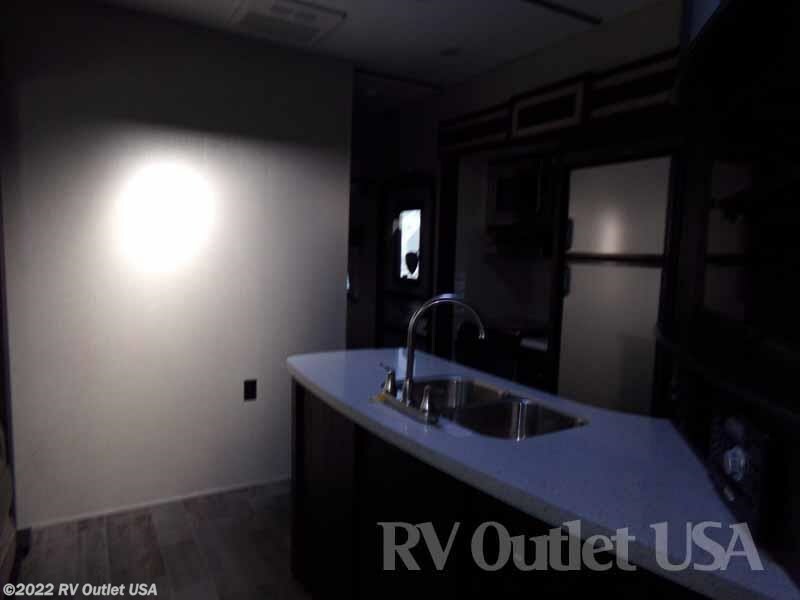 NEW WHITE EXTERIOR ** MAX CLEARANCE PASS THRU DINETTE! 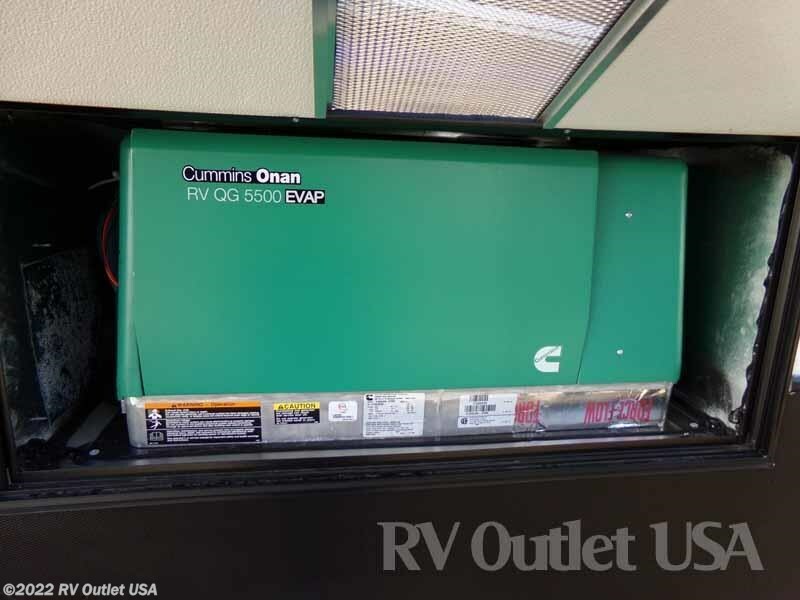 5500 ONAN GENERATOR ** POWER FRONT AND REAR STABS!! 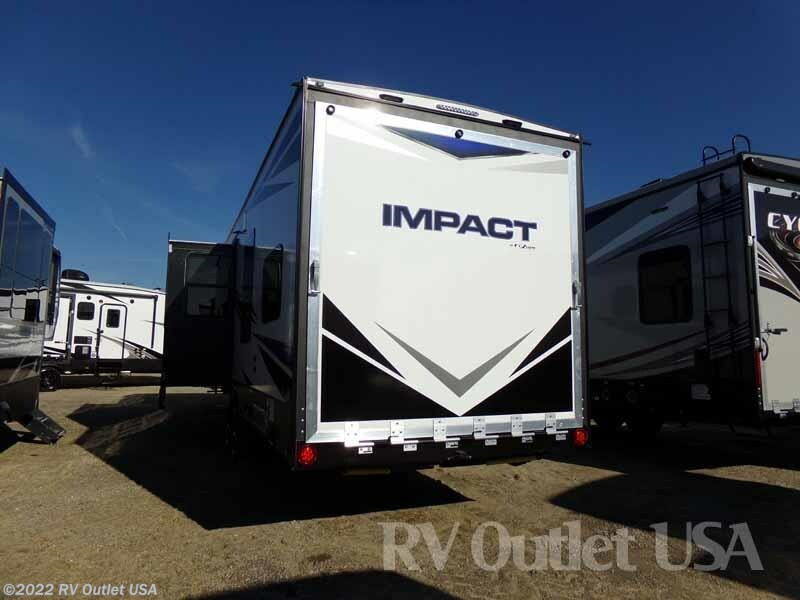 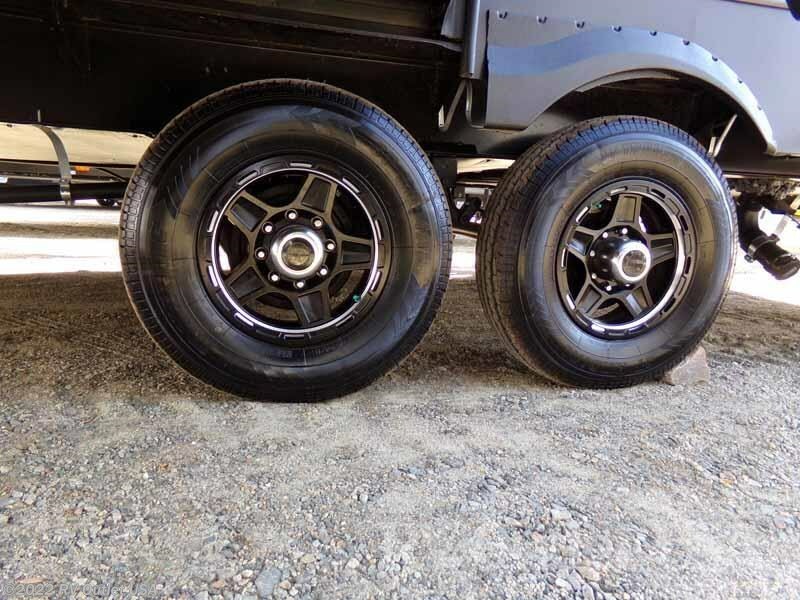 Introducing the brand-new 2018 Keystone Fuzion Impact 332 travel trailer toy hauler. 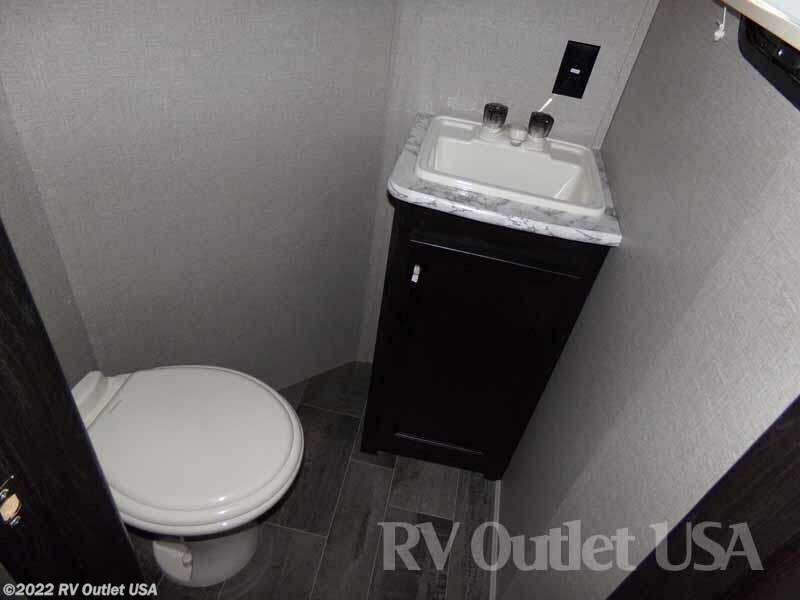 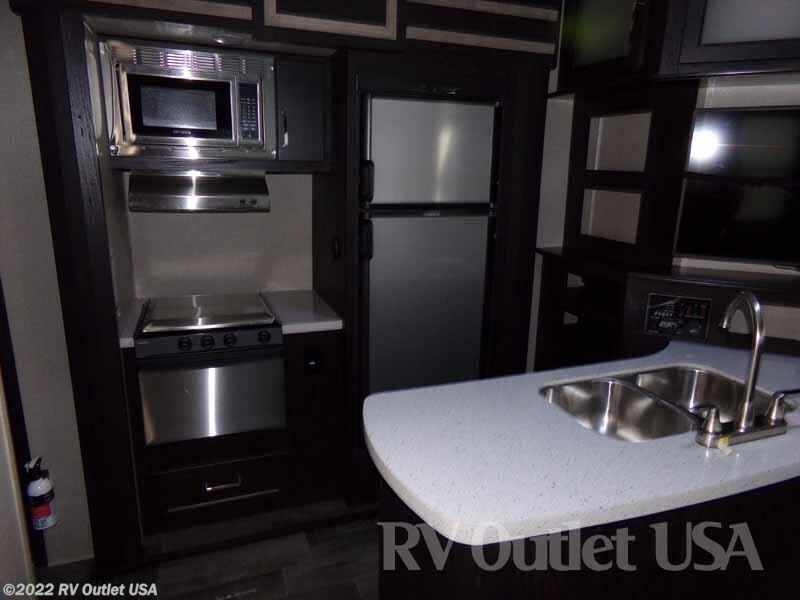 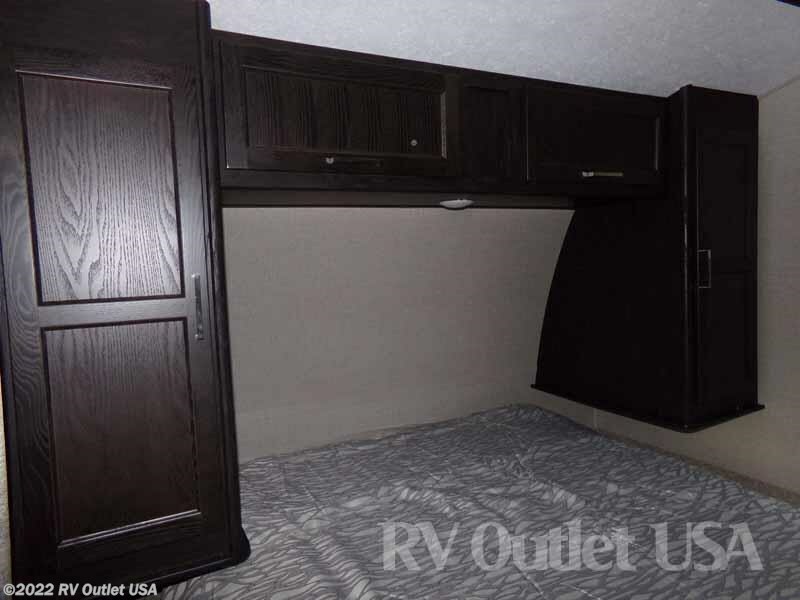 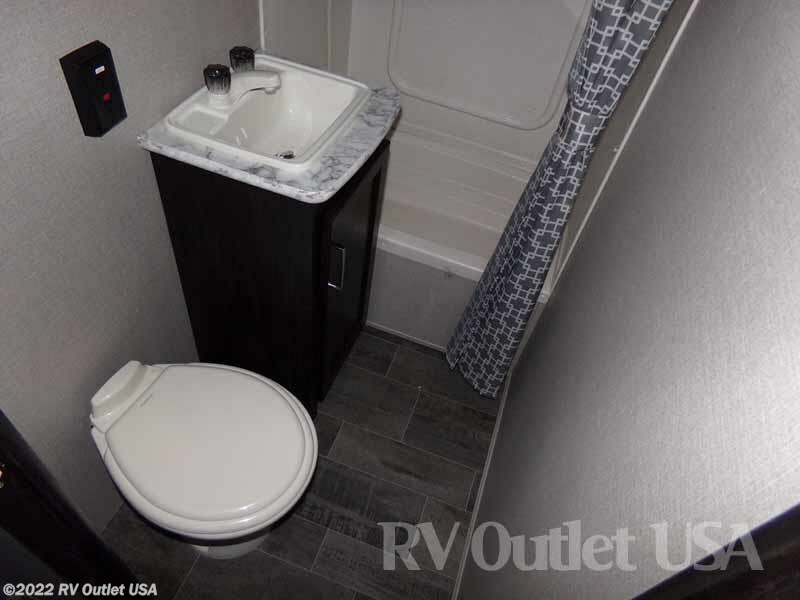 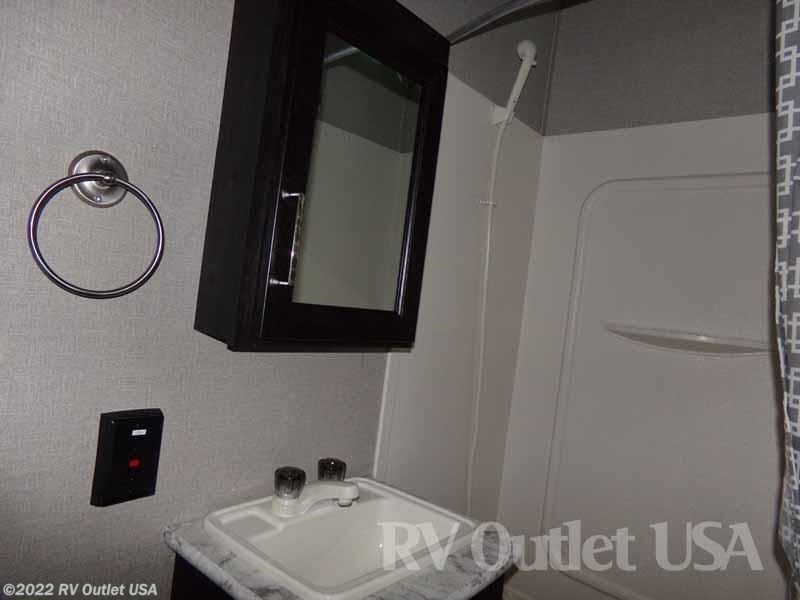 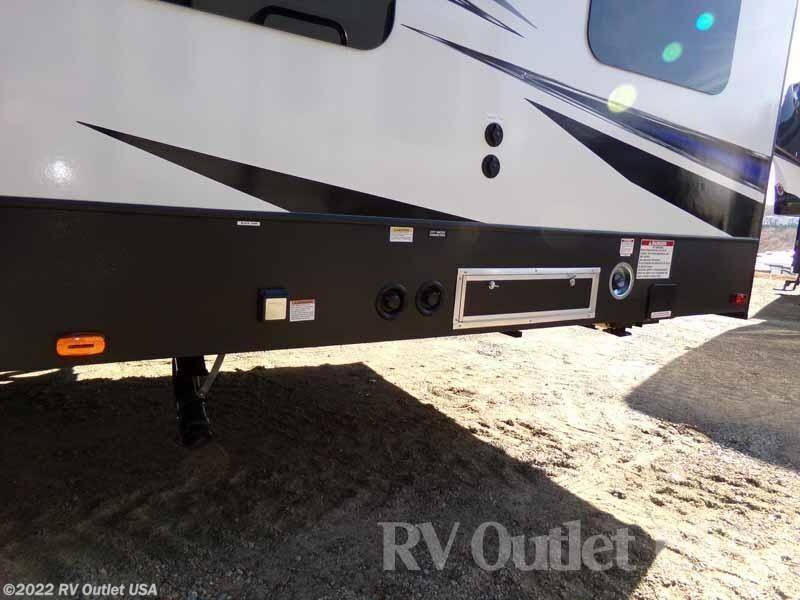 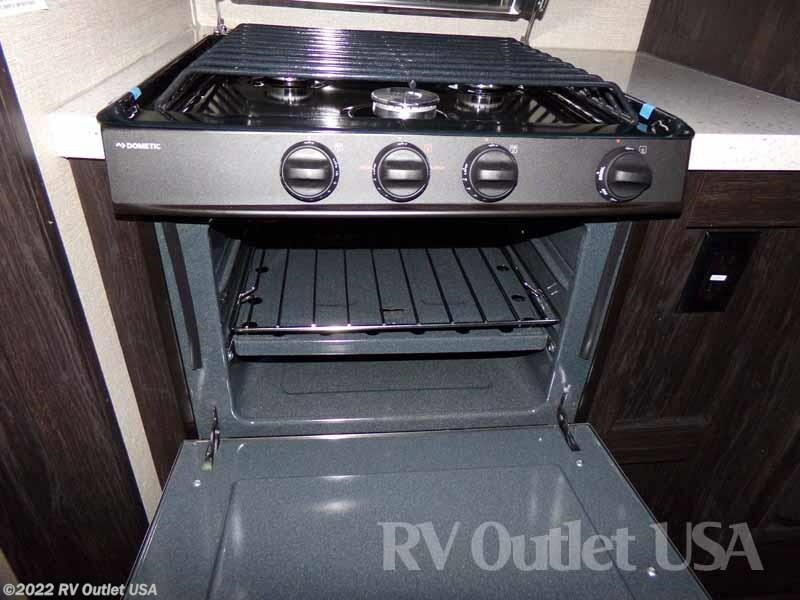 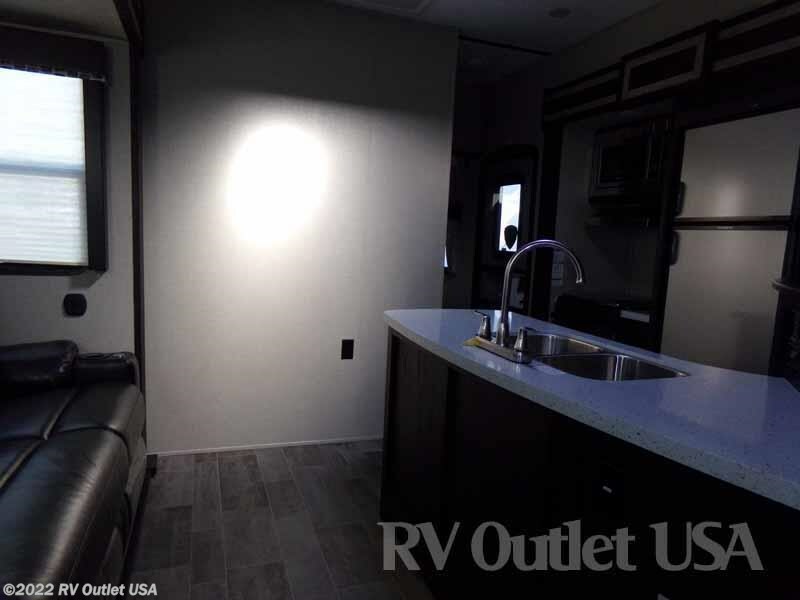 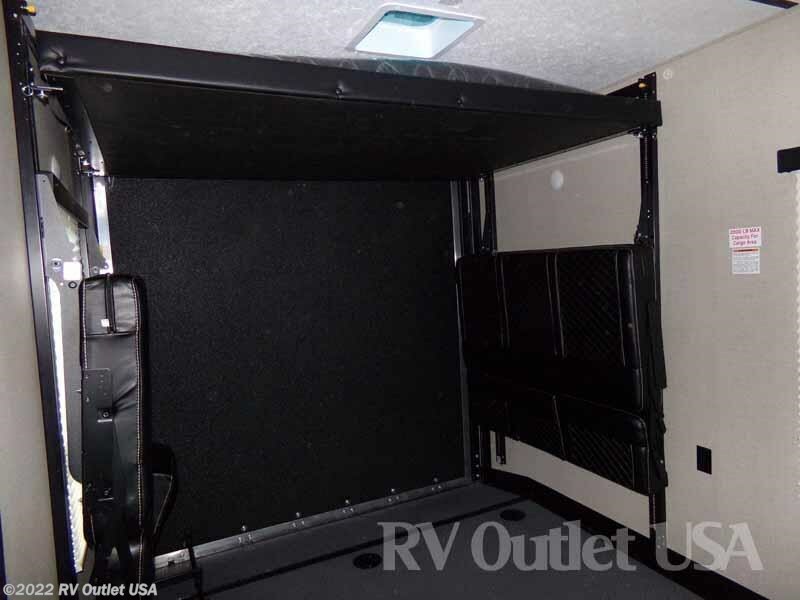 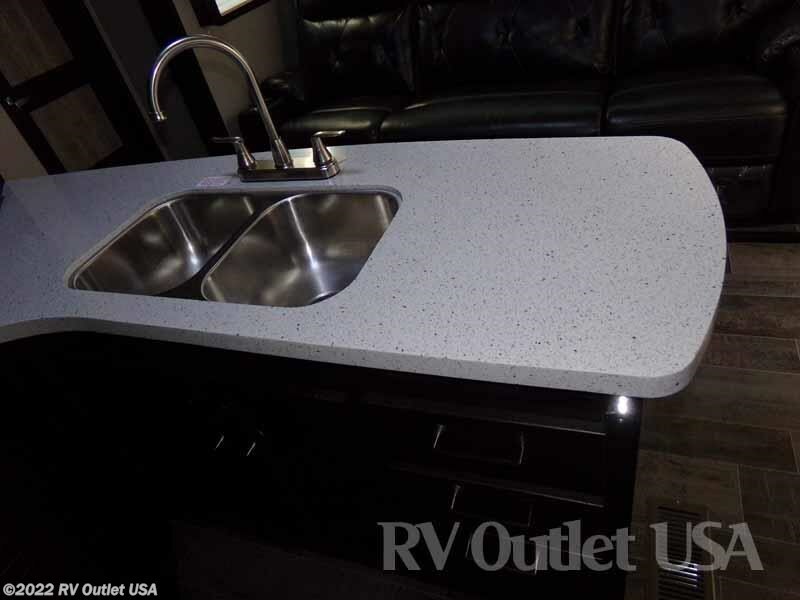 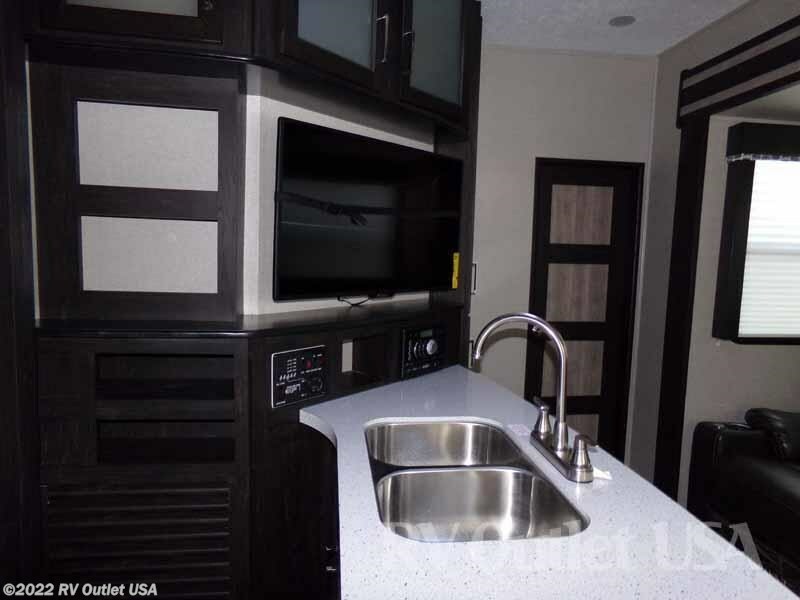 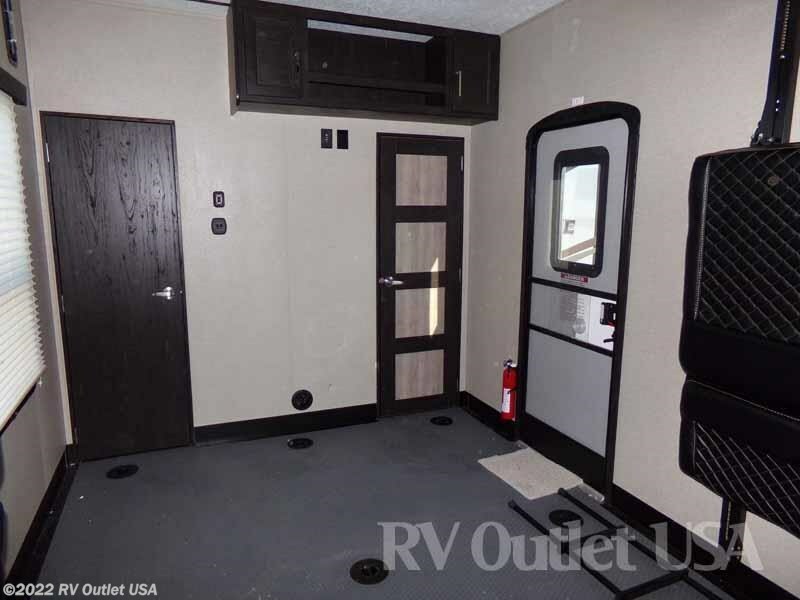 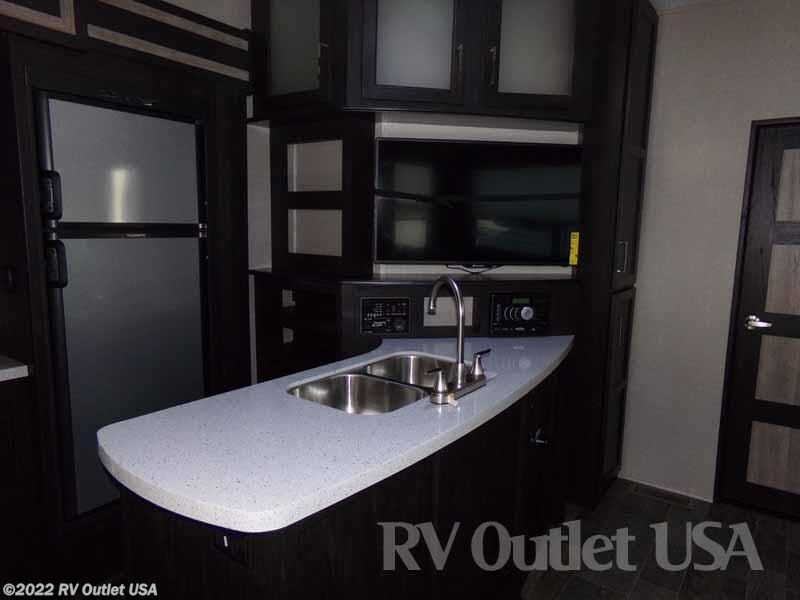 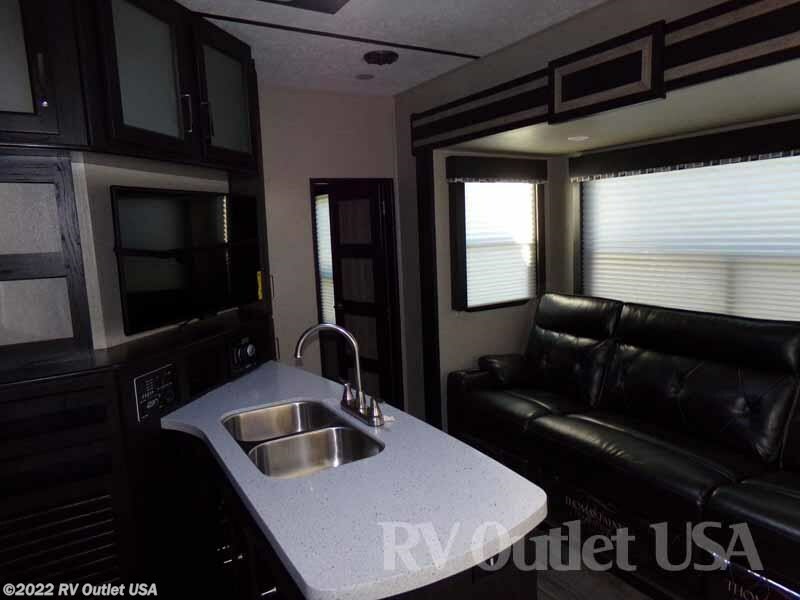 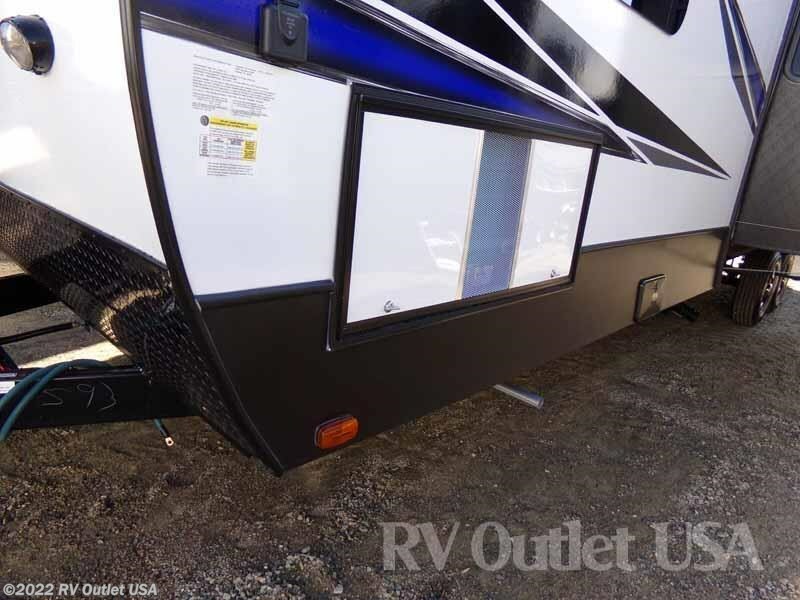 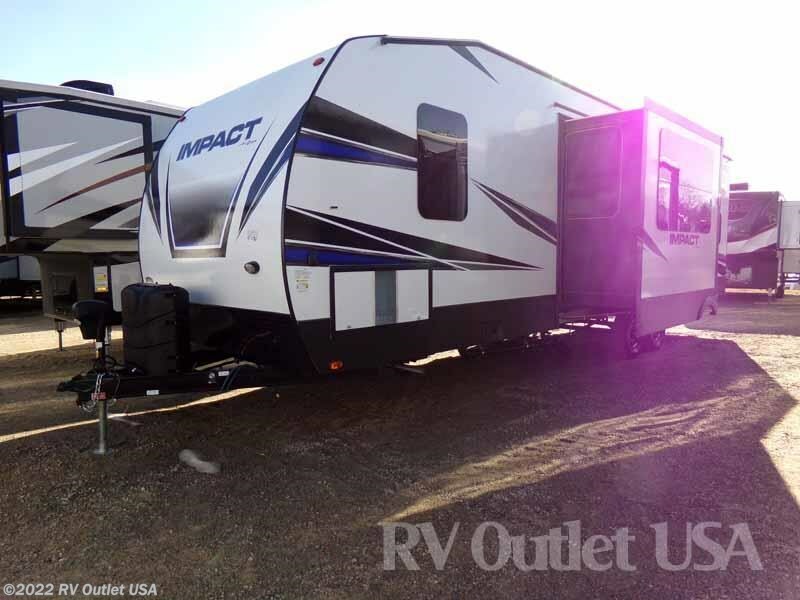 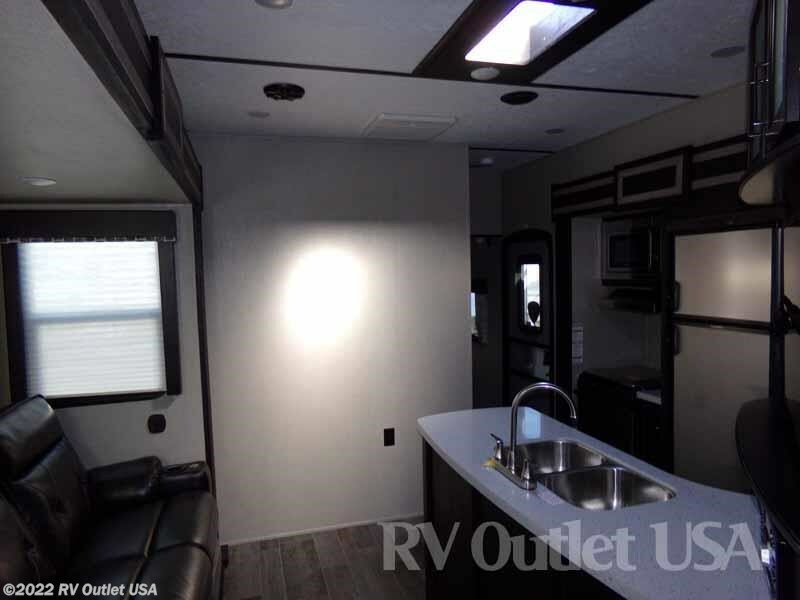 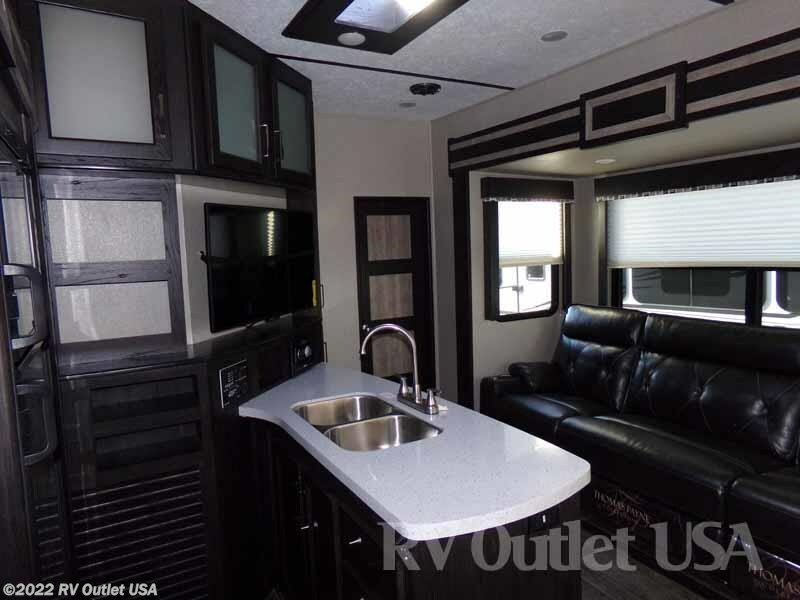 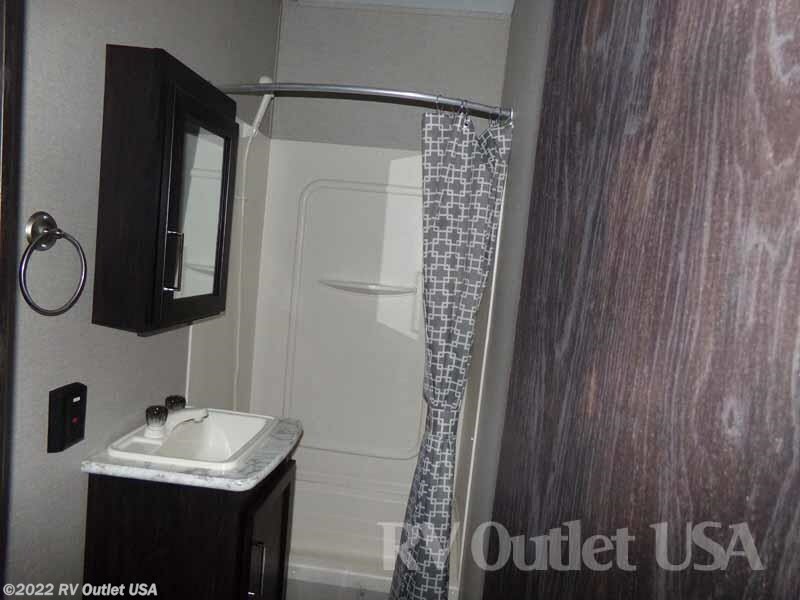 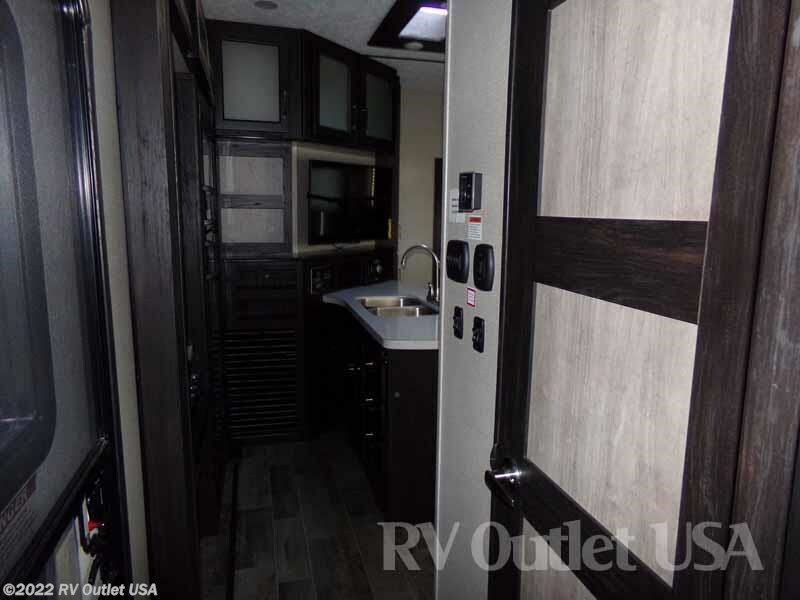 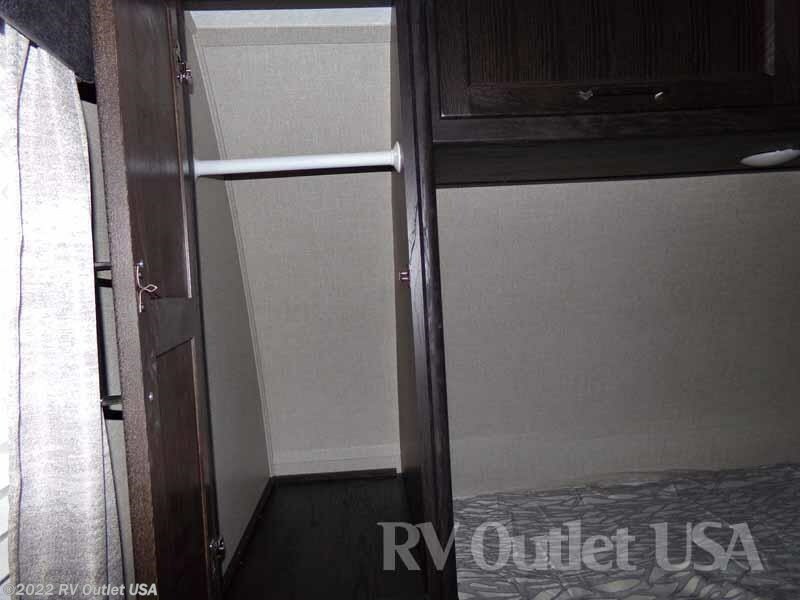 This is one the newest floor plans from Keystone Impact in their travel trailer toy hauler lineup with two slides, a 12' garage area, and this this toy hauler has a bath and 1/2!! 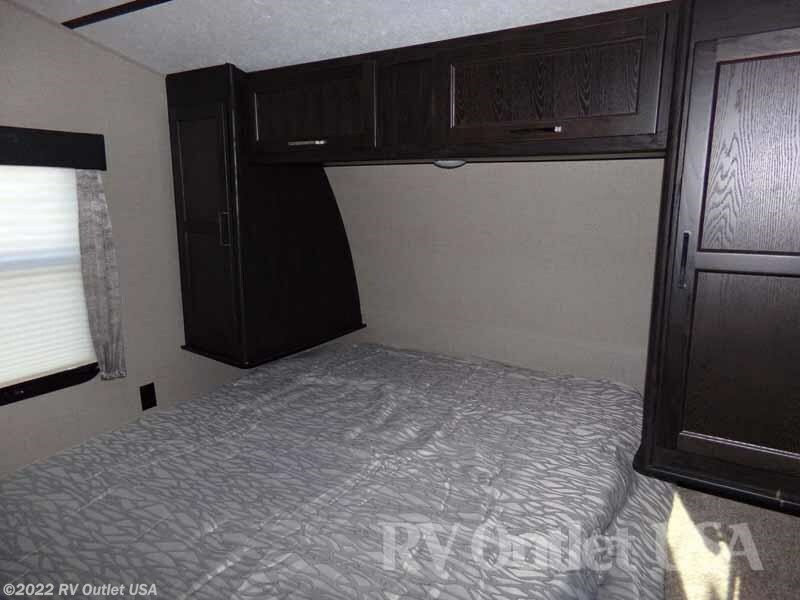 This floor plan has a walk around queen bed in the front with wardrobes on both sides and overhead cabinetry, and it has a side aisle bathroom with a tub shower combo, a foot flush toilet, and a sink with underneath storage all in one room for privacy! 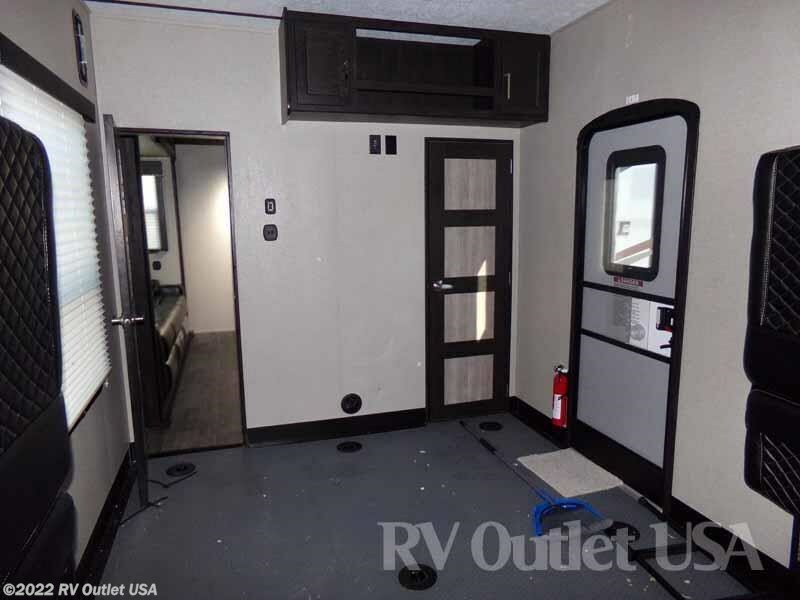 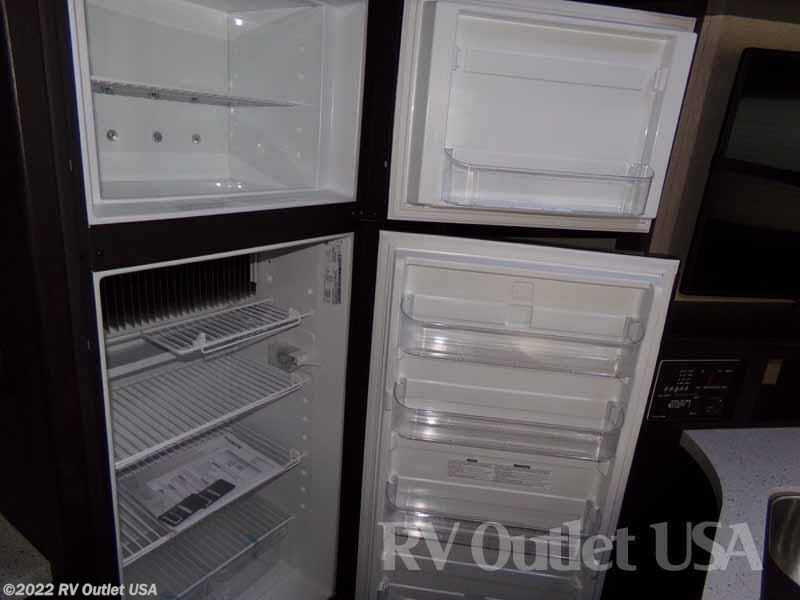 It has a slide on the off door side with a 97" sofa and across from that, a kitchen slide on the door side with an 8 cu ft refrigerator, a three burner stove top with oven, an overhead microwave, and plenty of cabinets for food storage. 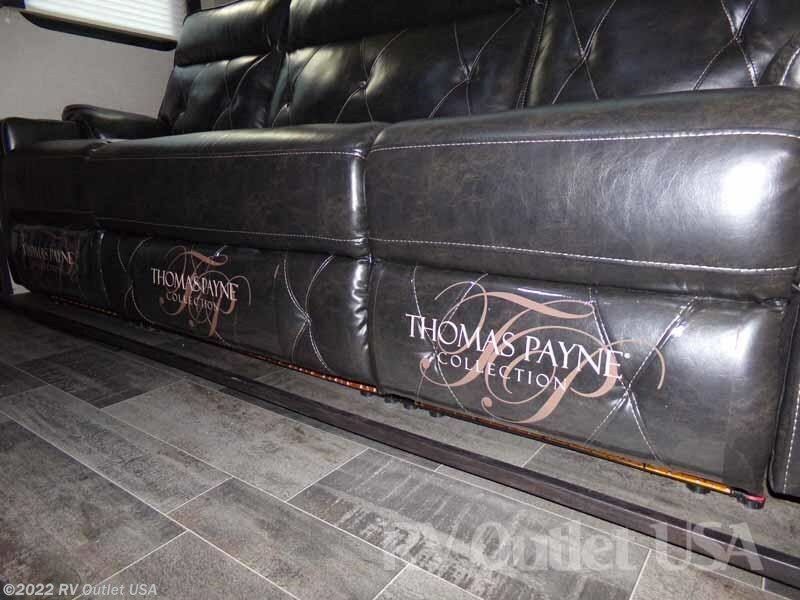 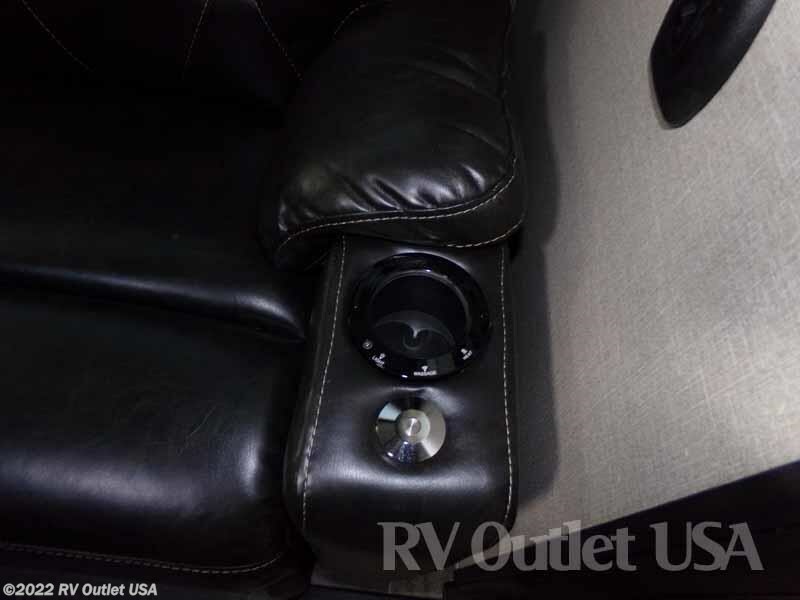 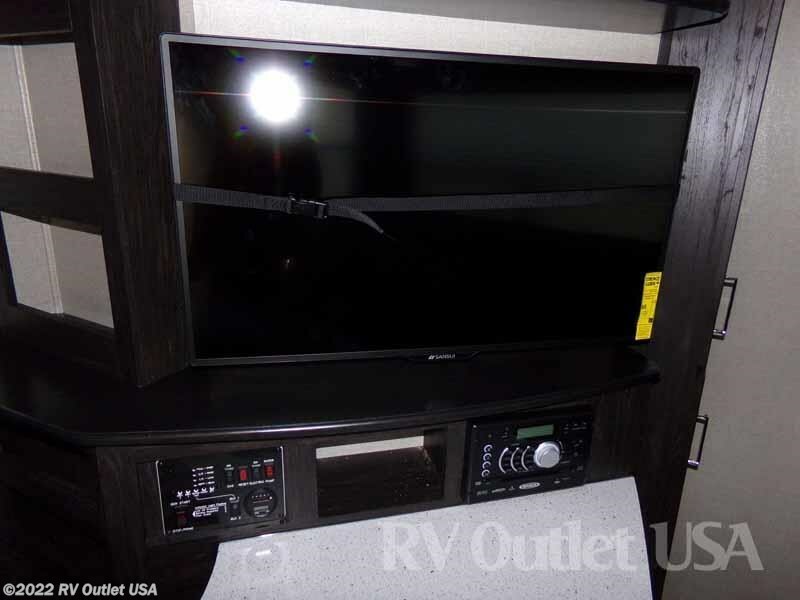 The entertainment center on this coach is placed in the perfect place where everyone can view the TV too! 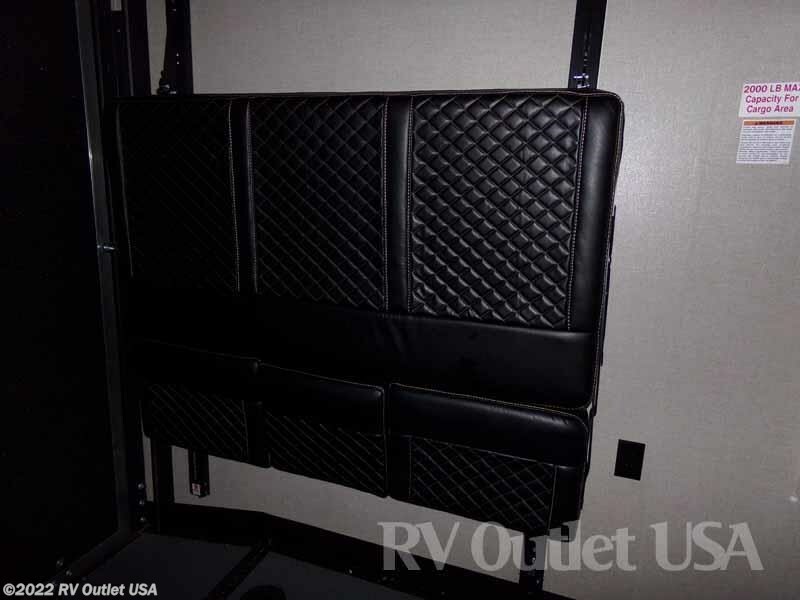 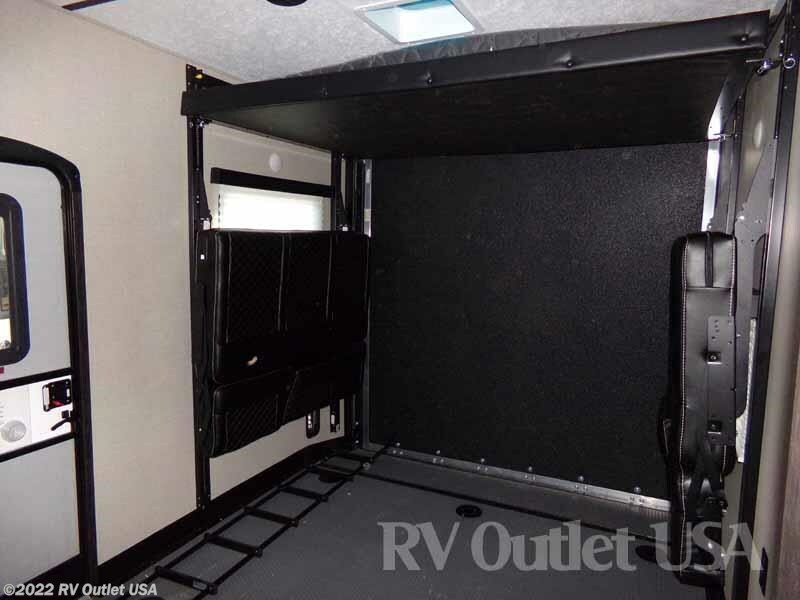 The cargo area is 12' and has the 5K tie downs, the dual opposing "Max Clearance" sofas with queen bed over top, and the half bathroom. 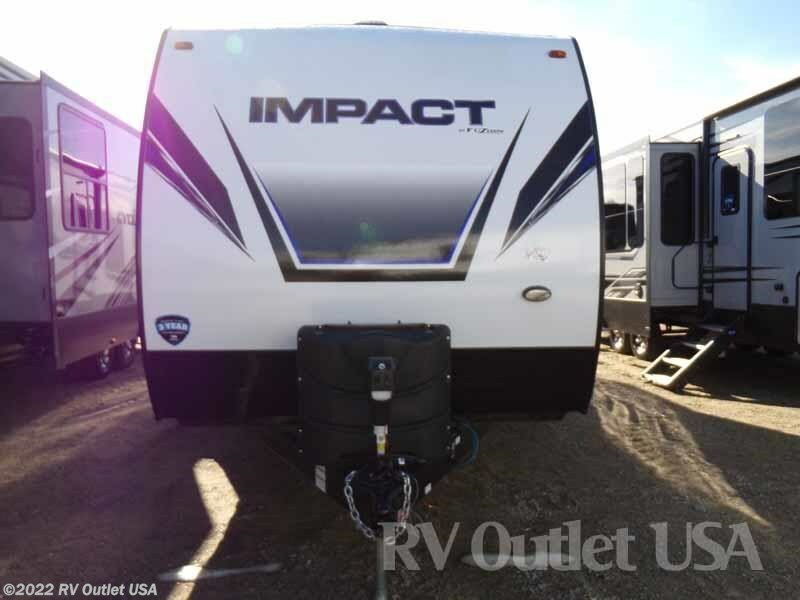 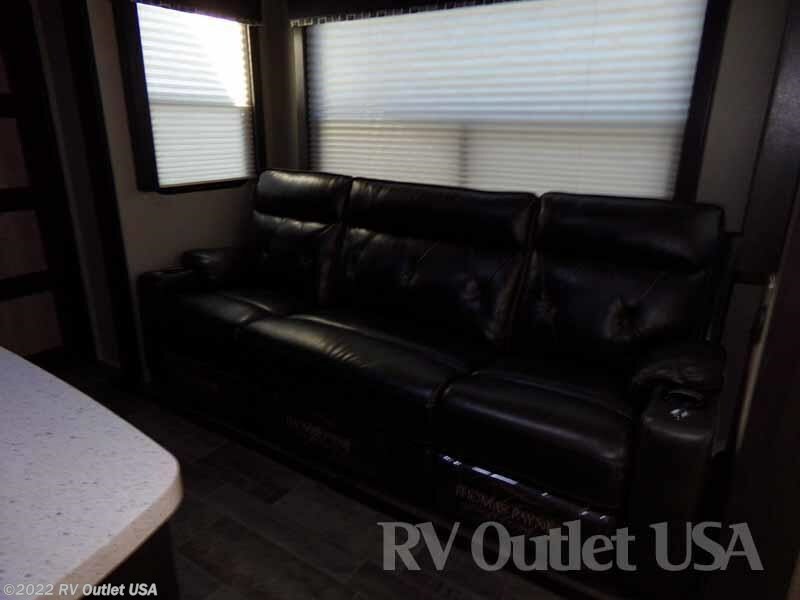 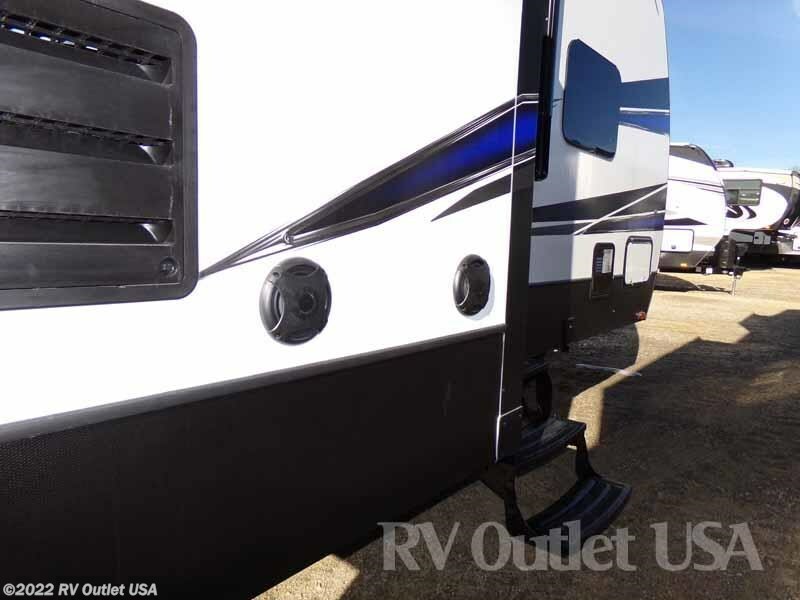 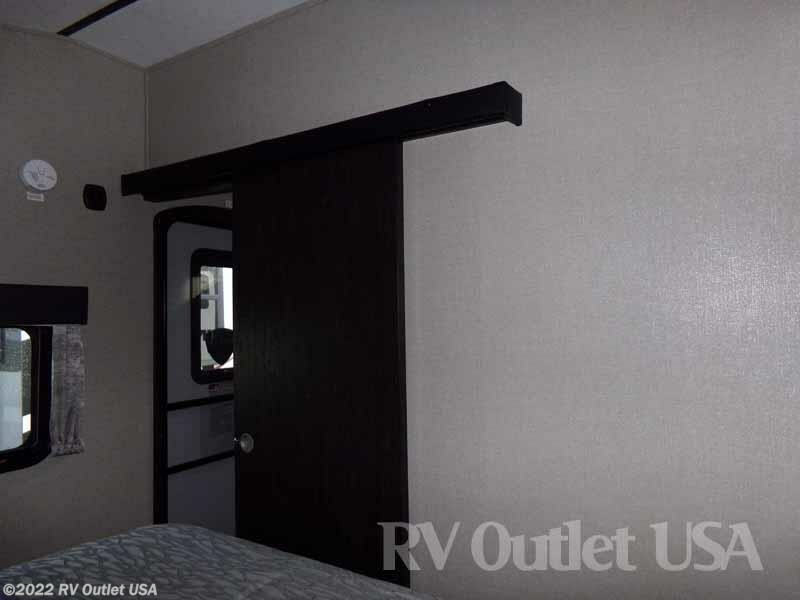 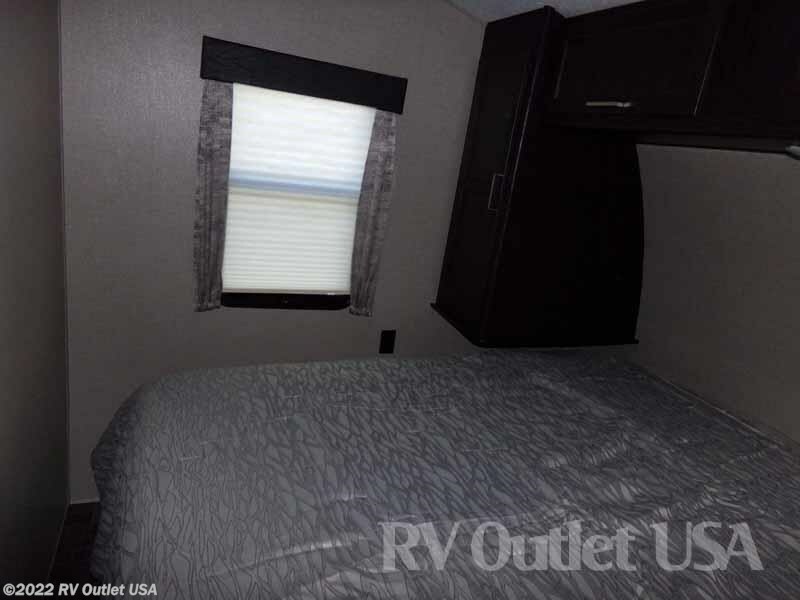 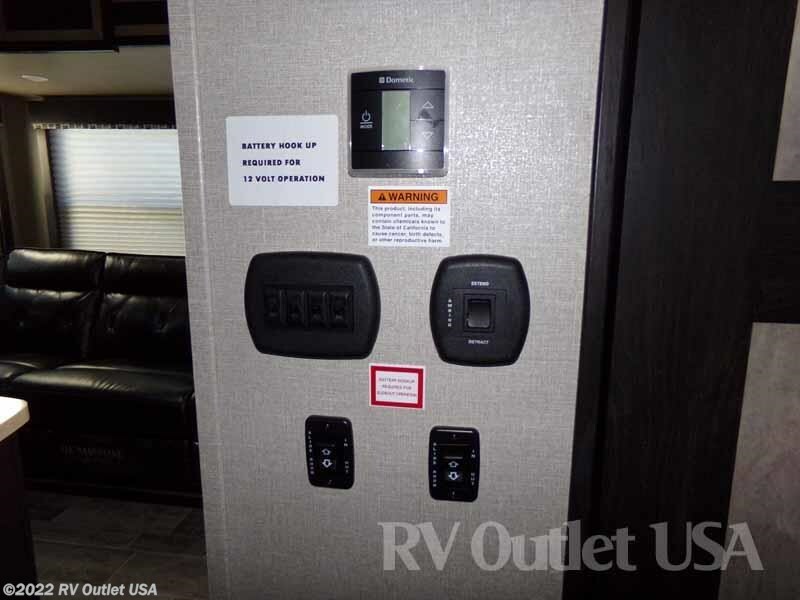 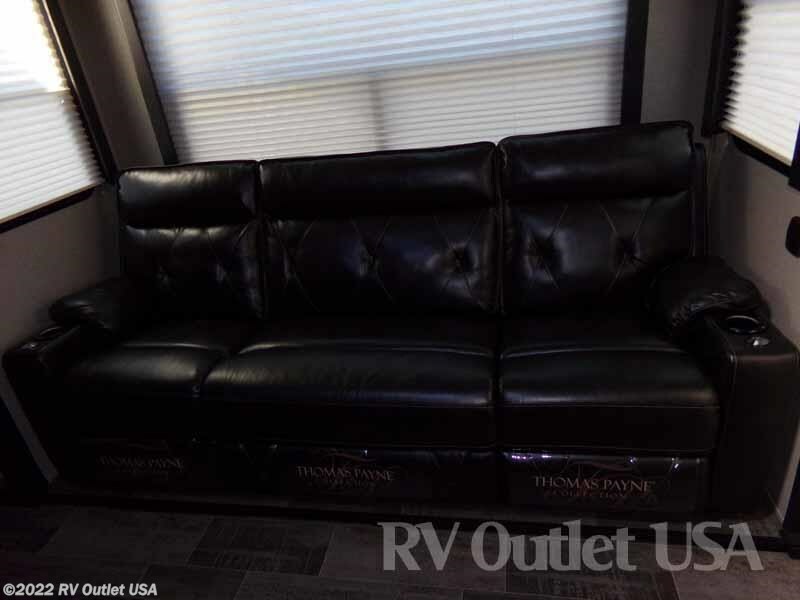 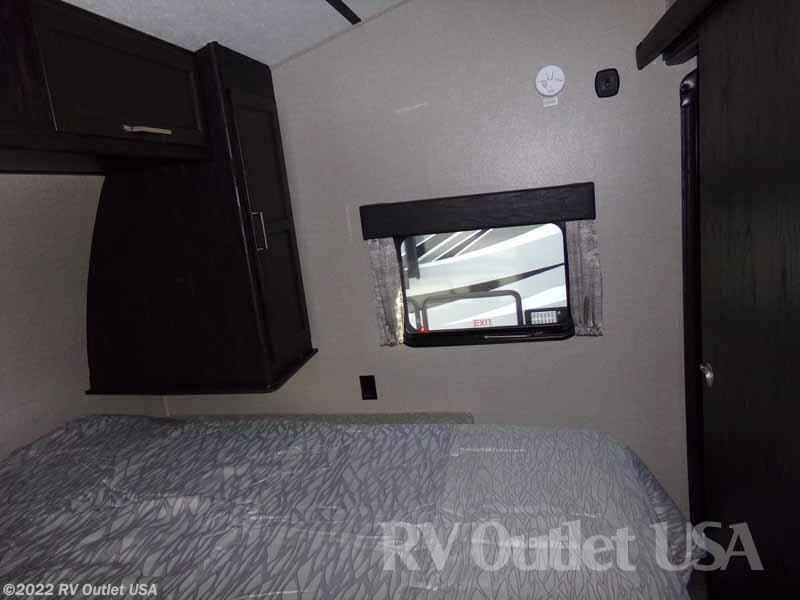 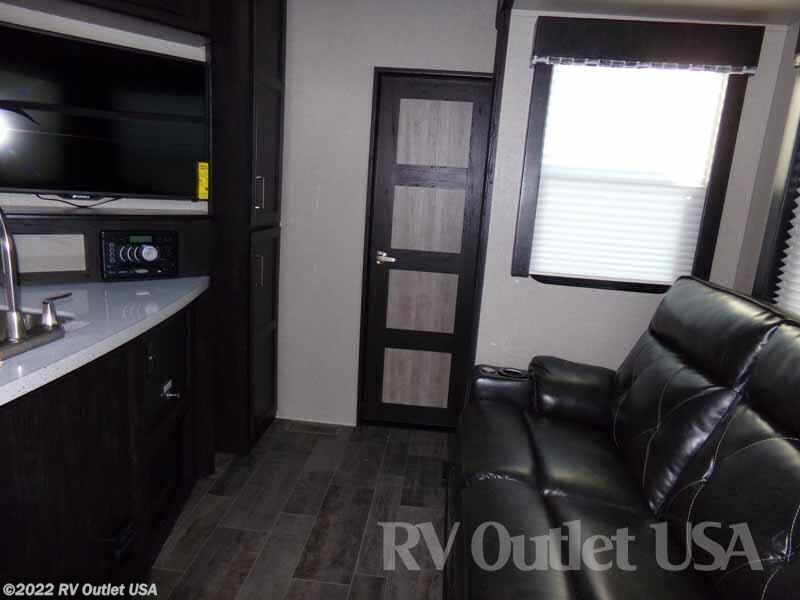 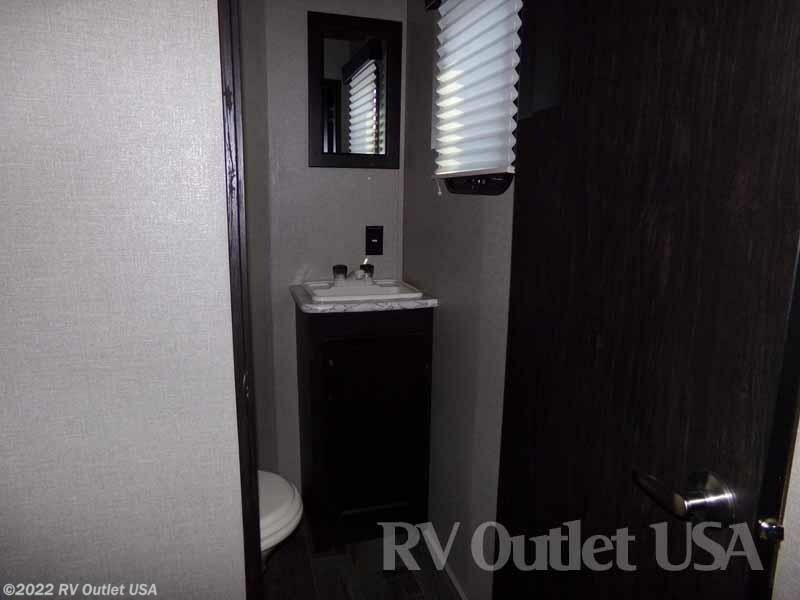 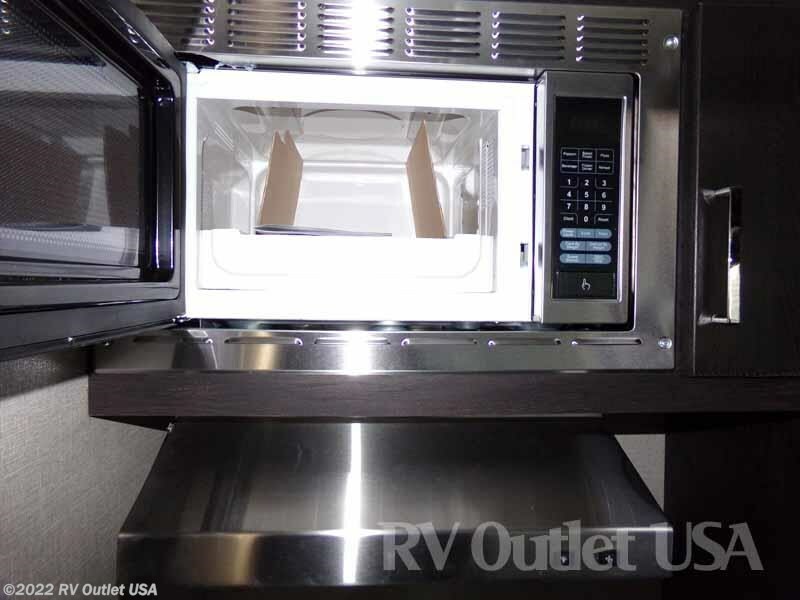 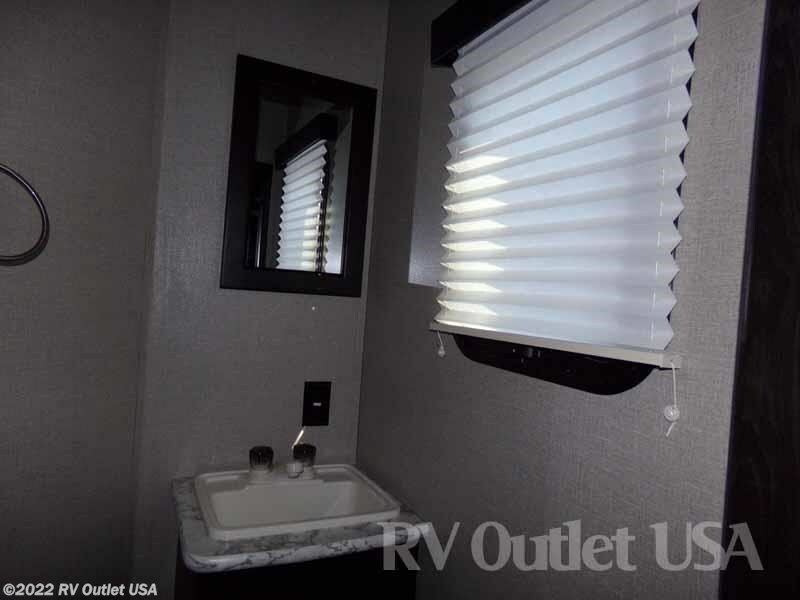 This is a really nice coach and it has all the newest features that Keystone Impact has to offer such as the new white exterior, the new style interior cabinets, frameless windows, slam baggage compartment doors, and the list goes on and on. 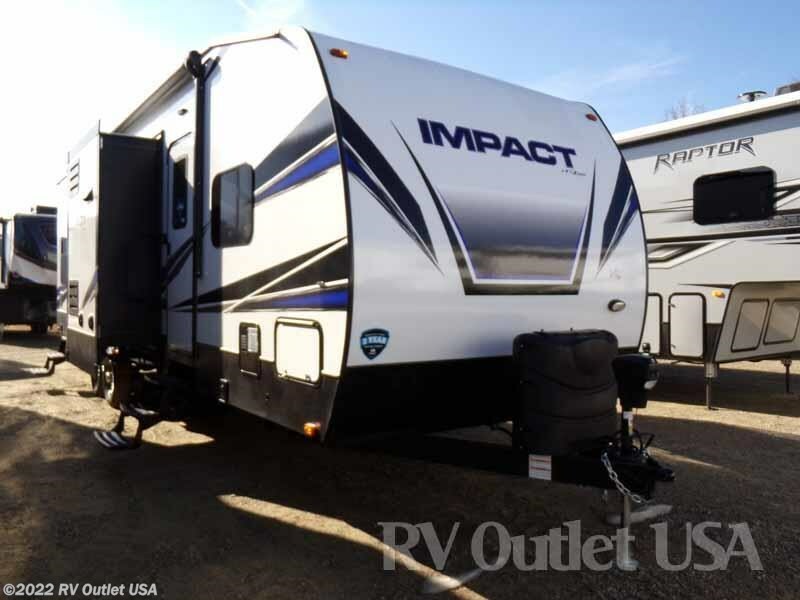 Here's a list of options that were ordered on this brand-new 2018 Keystone Impact 332 travel trailer. 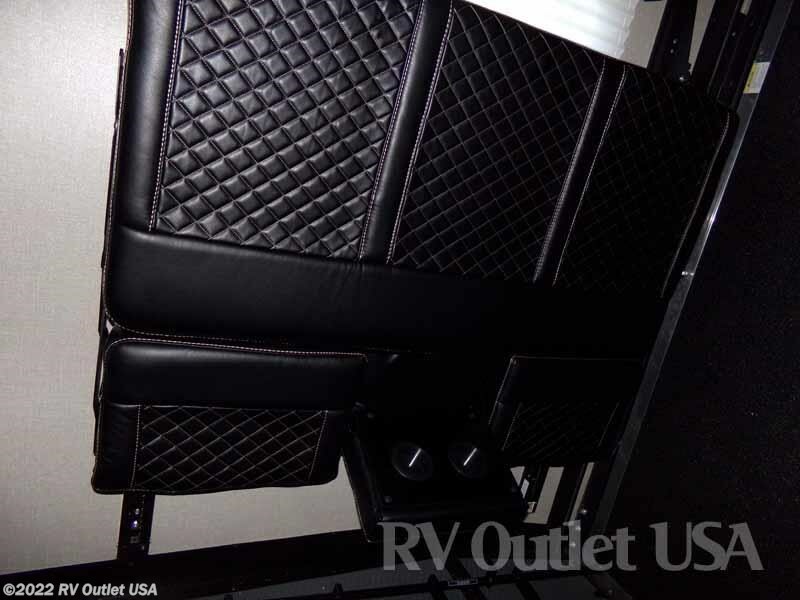 The interior color is the new Brindle, it has the Intense Interior package, the Extreme Exterior package and the new Knockout package! 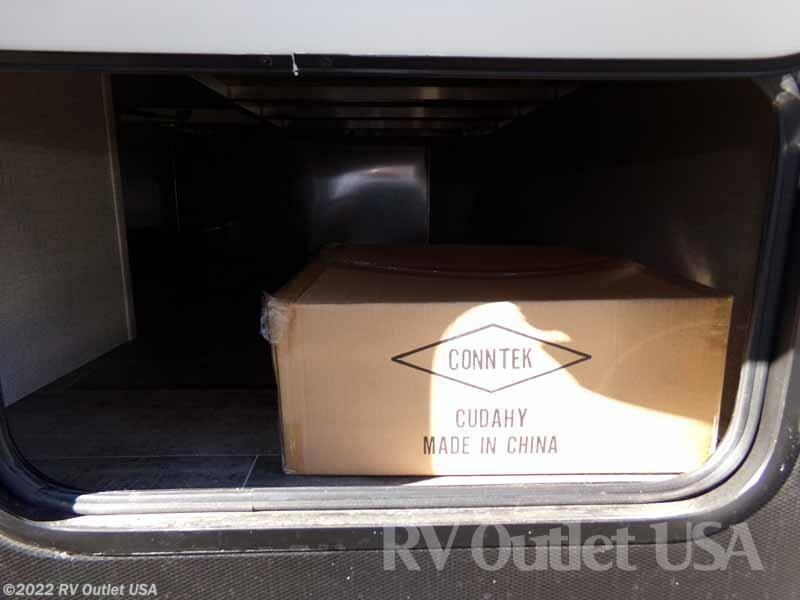 These (3) packages contain a lot of nice features. 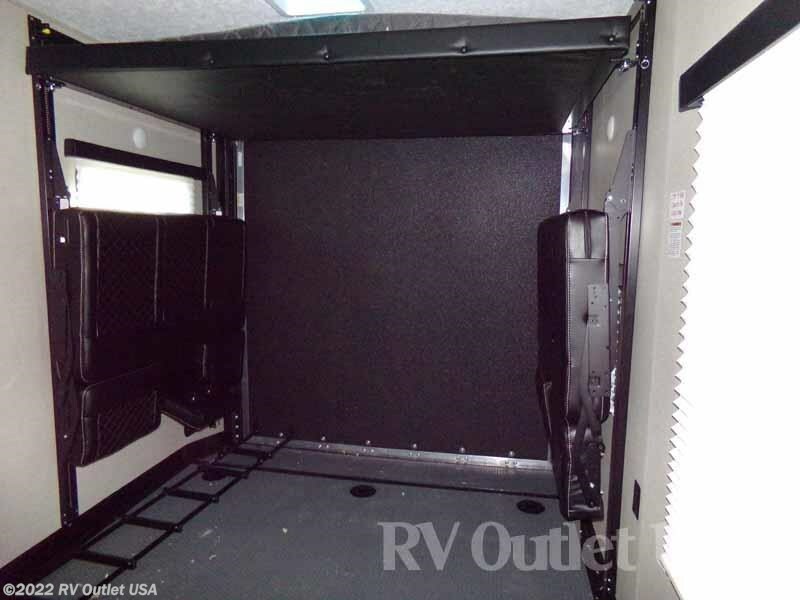 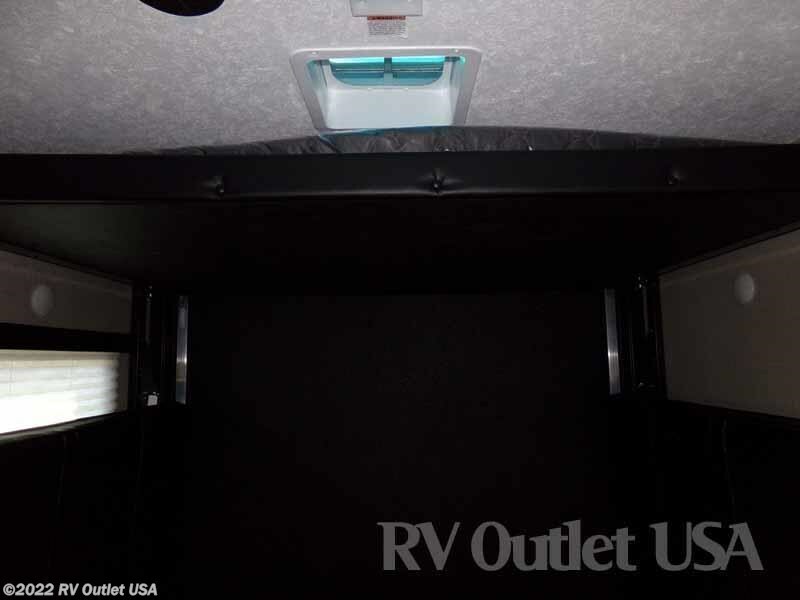 It has a lighted power awning, power front and rear stabilizer jacks, 50 amp service which is been braced and wired for second air conditioner, it has the upgraded 3/4 ton air conditioner in the main living area, a pull down screen wall in the cargo area, an (8) cubic foot double door refrigerator, dual opposing Max Clearance sofas, and a 5500 Onan generator with fueling station. 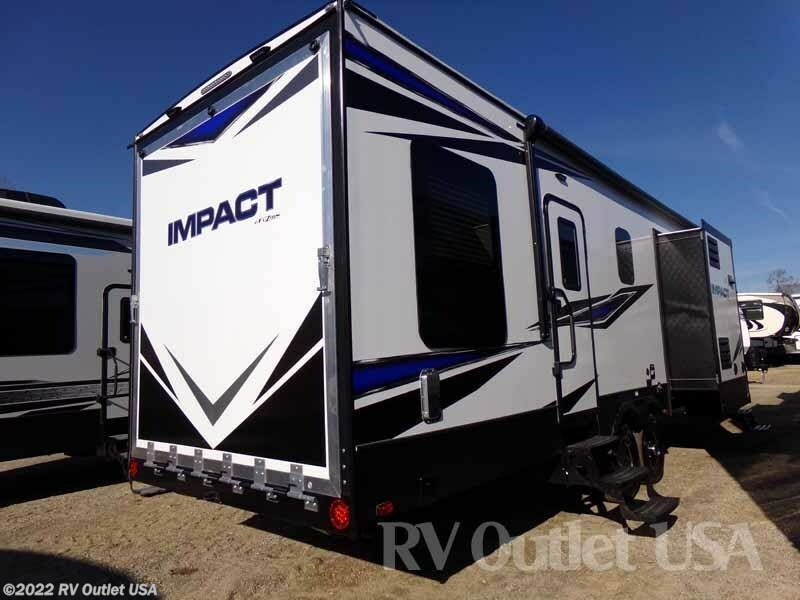 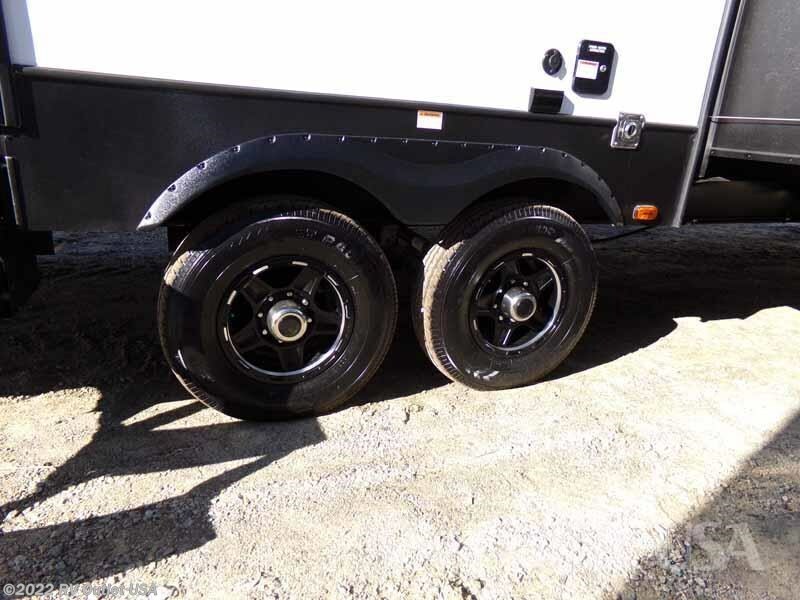 This is a really nice toy hauler with a lot of nice options. 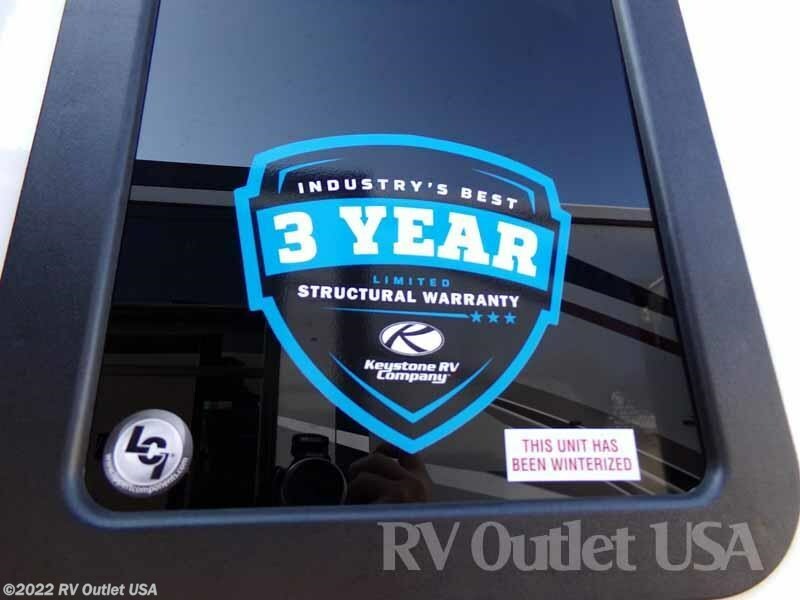 If you have any questions, please give us a call 888-299-8565 and ask for toy hauler sales, they'll be more than happy to help you. 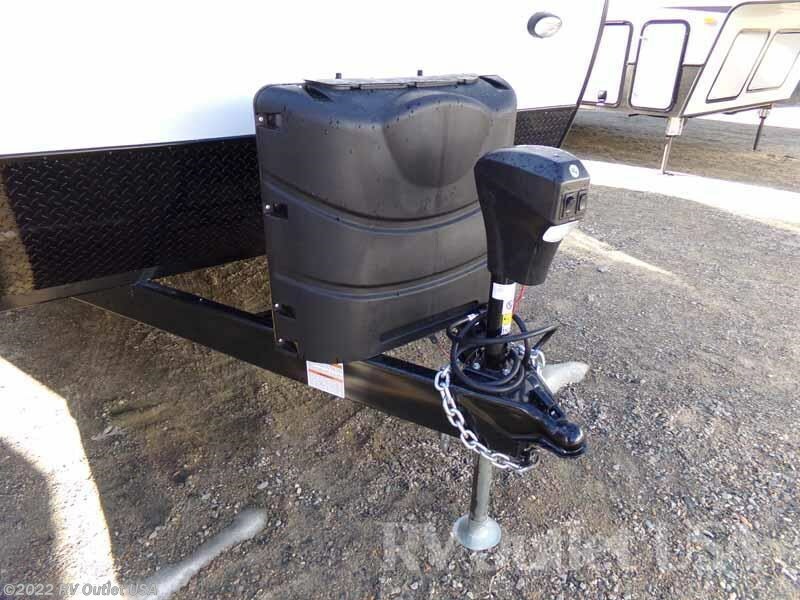 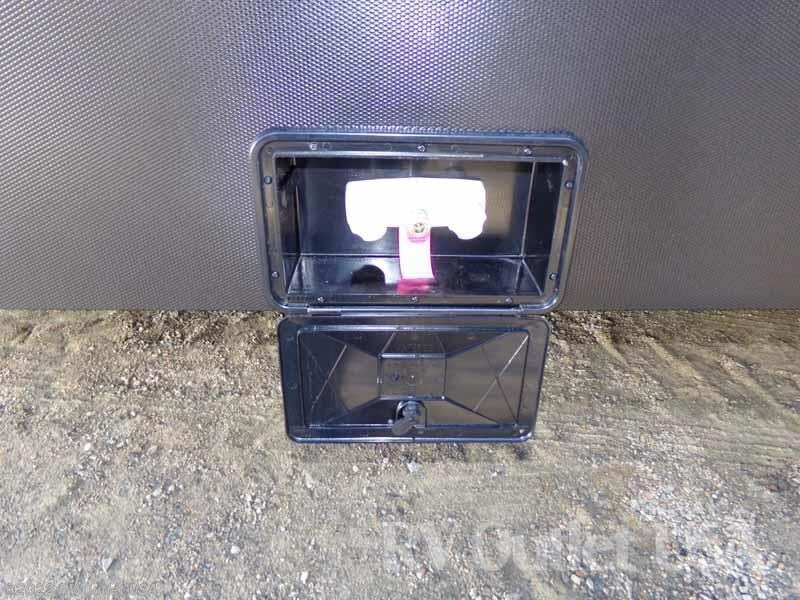 Please keep in mind we have no document or prep fees and we always offer our customers huge discounts for weight distribution kits, parts and accessories.